Welcome to Skiworks Real Estate software solution for single PC! This software is ideal for property consultants who work from their home or small office. 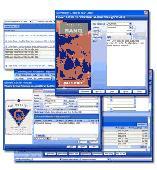 It helps you organize your clients, properties, sales and create an HTML website instantly! Fitness Assistant is a smart software solution for counting calories, managing bodyweight and tracking exercise. The software features a smart calorie monitoring system that significantly boosts your chances of reaching your target weight on the target date. By actively monitoring how your body responds to your calorie intake, Fitness Assistant calculates your real calorie expenditure and gives you an accurate calorie plan that is ultimate in flexibility. Set your goals and learn what you need to do every day. No more guesswork. DOVICO Track-IT Suite is an award winning software solution that monitors project costs, employee timesheets, and expenses. MS Windows, Web, Palm PDA's supported. QuickBooks, MS Project & Project Server integration. CMMI, SOX, DCAA Compliancy.